Perhaps one of the most important questions we need to answer in drug prevention is what are we trying to achieve. Recently we’ve published the outcomes from the Street Talk project that we did with Addaction (see the presentation below). In our eyes the results were incredibly positive and I think we should be very proud of what was achieved. As you’ll see what we are able to show is that the use of Motivational Interviewing improved young people’s knowledge about where to seek support, their confidence in taking informed decision, and overwhelmingly led to the young people saying that they intended to reduce the risks they were taking with drugs and alcohol. But not everyone shares my view that these are extraordinarily positive outcomes and a few days after we published our results we received an email – which had also been sent to Ministers, MPs and others – which was critical of what we achieved. It is perfectly acceptable to try to reduce the misuse of alcohol by young people, certainly to try stopping them from binge-drinking which is especially harmful to the liver. As alcohol is legal, young people can be advised about safe limits and how not to put their health in jeopardy. However when it comes to illegal drugs, the situation is entirely different. Firstly it should be the use of drugs, not misuse we should be talking about. Secondly, since drugs are illegal the aim should be to stop the use of them. Thirdly there is no guaranteed safe way to take any drug – warnings on packets of prescription drugs make that very clear. historical approaches to school drug education have not been particularly successful at reducing AOD [alcohol or other drug] use. This then poses the question as to whether effectiveness should be measured by abstinence or reduced use, or whether harm reduction is a more realistic and useful measure. Harm reduction programs offer greater promise of achieving worthwhile benefit because they have the flexibility to select strategies on the basis of evidence of effect. Within this model abstinence or reduced use strategies may be chosen if there is evidence that they reduce harm, but they are not goals in their own right. I’d be really interested in your views about how we position Mentor in this debate, how do we describe the outcomes we are reaching for and whether it is reasonable to achieve them? Do programmes that work to reduce harm fit with our mission, and can they be done without condoning drug and alcohol use? Tomorrow we’re launching the evaluation from the Street Talk project we’ve been running with Addaction. Of 2,196 young people who were screened, 71% had used alcohol, 39% had smoked cannabis and 9% had used another drug to ‘get high’ in the last 12 months. Just over a third (35%) had used more than one substance within the last 12 months. The next step was to identify those eligible to receive the brief intervention. Almost three-quarters of these young people were considered to be at some level of risk, and almost two-thirds to be at high or severe risk. Almost half admitted to getting in trouble whilst using substance(s), and 43% disclosed that family and/or friends had expressed a concern that they should cut down on alcohol and/or drug use. 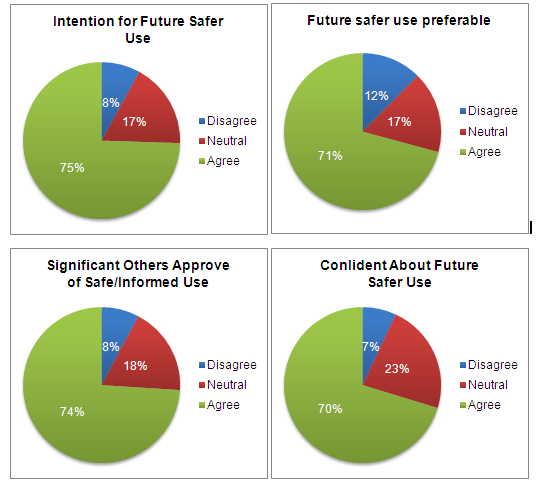 Of those who received the intervention, more than two-thirds said that their knowledge (72%) and confidence (71%) in making informed decisions about safer levels and methods of alcohol and drug use had increased. The full evaluation of the project will be published on our website tomorrow.